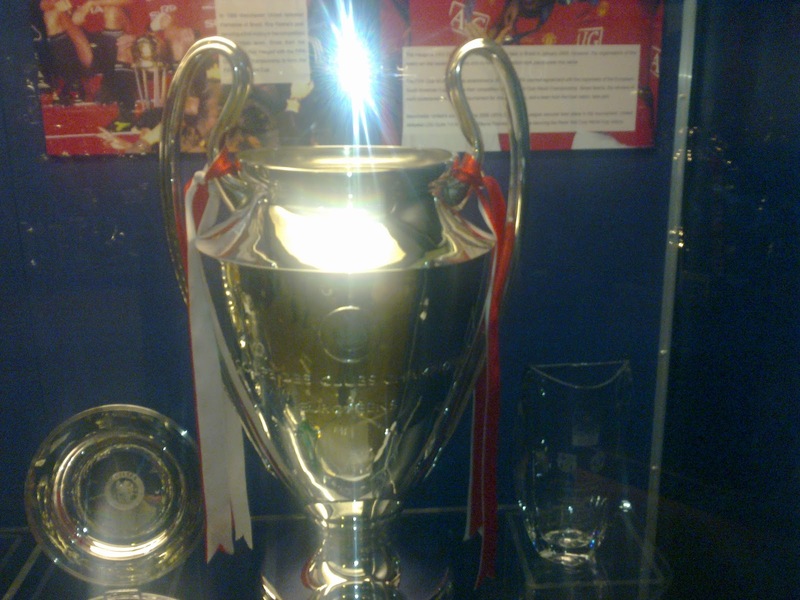 Old Trafford, Manchester - Manchester United Blog: We're Man United, we've won it five times!!!!! From the 2006/07 season to 2010/11 Manchester United have been the most consistent club in Europe; surpassing even Barcelona in the standards they have maintained. But as we know, United have won just one European cup in that time while Barca have won two. While a European League is perhaps a long way off, it is tempting to wonder how the reds would have fared if Europe's premier competition was run purely as a league rather than a hybrid league and knock out cup contest. The first task of this study was to identify the 'title contenders'. While we were committed to our work, we certainly had no intention of analyzing the results of Anortosis Famagusta or BATE Borisov (with respect to both clubs). Instead we narrowed the field of study down to the ten teams that had performed best over the past 5 seasons. All four winners from 2006/07 to 2010/11 were included in the 'League'; AC Milan, United of course, Barca and Inter. We also included finalists Liverpool, Chelsea and Bayern Munich along with any other team who reached a semi final AND had played at least 36 matches (this was the lowest number played by any recent CL winner; AC Milan). The 36 game threshold saw Shalke 04 eliminated from contention but happily, allowed Real Madrid to be considered as well as Lyon and Arsenal. We then compiled all of the eligible results of each team over the period as shown in the table below (1.1). (1.1) In this table points have been awarded for all games, including knock out games (except finals), based on the standard 3 points for a win and 1 point for a draw system. From this table we see that United are well on top. The table above is a pretty sight for reds but of course it may also be misleading. Skeptics would argue that many of United's 'points' could have been won against group stage minnows rather than the top teams. It is also important to remember that in any league of worth it is the results between the competitors that count; not results against teams who are not even in the 'league'. To simulate a realistic league table therefore we have examined the results between the 'contenders' over the 5 season period. By doing this we were able to calculate the average results when each of the teams met. For example, United played Barcelona at home and away in 2008; winning one and drawing one. In addition, Barcelona beat United in two finals leaving United with the following record. P4 W1 D1 L2 PTS 4. 4 Points from 4 games means that United average just 1 point per game against Barca. Over the same period, United's record against Chelsea was P3 W2 D1 L0 PTS 7; meaning that United average 2.33 points per CL game against Chelsea. Thus, if United's first two games of the 'league' season were Barcelona and Chelsea, the reds would expect to take a total of approximately 3 points from the first two fixtures (2.33 + 1 += 3.33). In some cases however there were no head to head results. United did not play Liverpool or Real Madrid over the 5 seasons. In such cases we have assumed United's overall average (2.24 points). The table below (1.2) shows the average points shared between the teams. (1.2) Going horizontally United gain an average or 1 point per game against Barca, 1.5 points against Bayern etc. United did not play Liverpool so their overall average in European competition, 2.24, was used. We then add up all of the points to get the team total. eg. United (counting across horizontally in the table) 1pt + 1.5pts + 2.33pts +2.24pts + 2.24pts + 3pts + 2pts + 2pts + 2.25pts = 18.56pts. From this table we see that Barcelona played 8 of the 'contenders', more than anyone else. United played 7. Chelsea and Arsenal played the fewest number of games against 'contenders'; just 4. We also note from the table that apart from Barcelona, United have a decent record against the other contenders and while it might appear generous to apply their average of 2.24 points against Real Madrid, as we will see in the next table (1.3), it does not make a difference to the final standings. *It is also worth noting that Milan's average of 3 points against Liverpool is based on a single game; the 2007 final. While it may seem harsh and perhaps unrealistic that Barcelona are only in third place it is worth remembering that they have a poor record against English sides in England. Their last 5 visits to England (including finals) have yielded 1 win 2 defeats and 3 draws. They have also lost at Inter in recent years and been held at home by Real Madrid. Of course the main point that the table illustrates is that United have the best record between top teams as well as having the best overall record. It is therefore incorrect to suggest that they only gain their points against the minnows. So we have now demonstrated that overall and in games against the big teams, United have the best record over the past 5 seasons but how would this translate into silverware? We can assume that in a league scenario the most consistent team would win the trophy most often. Surely United would have managed more than a single European title over that remarkable 5 year period had the format of the tournament been different. But how many would they have won? The next table (1.4) shows the season by season breakdown in terms of average points. From the table we see that the 2006/07 season would have provided a thrilling three way chase between United, Liverpool and Chelsea with the Scousers, edging Chelsea out, as they did in the actual semi final. The unknown quantity is the possible showdown between United and Liverpool which would have been decisive. We are tempted to look at the Premier League results between the two teams as a guideline but in truth, Liverpool were an excellent European side at the time and were well above their overall points average that season. United were down on their average of 2.24; effectively operating at 89% of potential. In the simulated table they achieve 18.56. If we adjust to 89% of normal, United score 16.5. Liverpool, on the other hand were going at 112 percent of normal which would have moved them to 16.32 in the simulated table. It's too close to call but we reluctantly side with Liverpool given the momentum their form would have generated. 2008 on the other hand would have seen the trophy come to Manchester. United topped the points chart and also beat their closest rivals Barcelona over two legs. 2009 is a more difficult call. Again United topped the points table but the unknown quantity is a Barcelona visit to Old Trafford. We are siding with United on this one however. From the simulated points table, we have shown that Barca would have to beat the reds both home and away to bridge the gap, and even though both United and Barca were below their usual points average we still think that with Rooney, Tevez and Ronaldo in the side, the reds would possibly have gained a draw at Old Trafford. 2010 and United make it three in a row. The reds topped the points charts again in 2010 despite going out on away goals in the quarter final against Bayern Munich. With a points average of 2.2 (fractionally below par) United were well ahead of Inter and a disappointing Barcelona. 2011; Although United topped the points average yet again, we are giving this one to Barcelona, with Real Madrid second. The catalan's showing in the CL final is the clincher here. It would be hard not to imagine them turning us over, even at Old Trafford. We are also prepared to forego our 2.24 points against a much improved Real who would surely have performed significantly better than they had over the previous 4 seasons and would have pipped United for second. So after all of that it is not unreasonable to assume that United would by now have 5 European cups in the cabinet had the competition been a league system. Unfortunately we would possibly still trail Liverpool 6-5. Barca would currently have 4. But of course that is all fantasy. What is real however is United's phenomenal consistency which we have highlighted in this study; and not just against the small teams. It is our hope, and the hope of all reds, that somehow that consistency will be rewarded someday.